Societal concerns with environmental questions and sustainability are priority issues; the exploitation of lithium cannot be carried out without considering environmental issues. The H2020 (IC&DT) Project LÍTIO is a joint project between a mining company, three polytechnics and the national professional association of geologists intended to create value for natural endogenous resources associated with territorial innovation in the mining district of Gonçalo. Its aims are preservation and sustainability of lithium through the development of a product, processes and services, environmental monitoring and innovative proposals for regional tourism promoting the mining area. Lithium is an alkaline metal with the atomic number three. It is the lightest metal on Earth, as well as the least dense solid element. Lithium is a rare metal in the Earth’s crust and never occurs freely in nature. Its main sources are the minerals lepidolite, petalite, amblygonite, zinnwaldite and spodumene. Lithium is commercialised as a concentrated mineral in various chemical compounds (particularly in the form of carbonate or hydroxide). Lithium applications are increasingly diverse: it is used in ceramic and glass production, metallurgy of aluminium, manufacture of synthetic rubber and of lubricants, the process of purification of air in confined environments, in batteries as lithium bromide, and as lithium carbonate it is used in the pharmaceutical industry for the treatment of depression. With the increase in demand, and the consequent rise in the price of lithium, especially of the compounds used in the manufacture of lithium batteries, lithium carbonate and lithium hydroxide, pegmatite deposits are becoming cost-effective sources of lithium. After having secured the best pegmatite deposits in their countries, Australian and Canadian prospecting and research companies (P&R) began the study of other deposits of lithiniferous pegmatites occurring in Europe and particularly in Portugal, which is one of their P&R bases. The year 2016 was a year of excellence in the emergence of numerous ‘young companies’ around the world that together with traditional industrial companies operated not only from hard rock, but also from lithium exploration of salar brines. In 2017 Portugal ranked in sixth place worldwide and first in Europe in the mining production of lithium (USGS, 2018). One of the largest lithium deposits belts in Europe is located on the Iberian Peninsula (Figure 1). These deposits are essentially lithiniferous pegmatite bodies that outcrop in metasedimentary rocks and granitoids of Variscan ages, along a zone of NNW-SSE direction in Galicia-Trás-os-Montes Zone (GTMZ) and Central Iberian Zone (CIZ) (Roda-Robles et al., 2018; Farinha Ramos, 2007). The National Government, aware of the potential existing in the country, announced the establishment of a working group at the end of 2016 (Declaration No. 15040/2016 of 13 December 2016), with the mission to identify and characterise all of the lithium deposits in Portugal, as well as to evaluate the possibilities of their prospecting and exploitation. 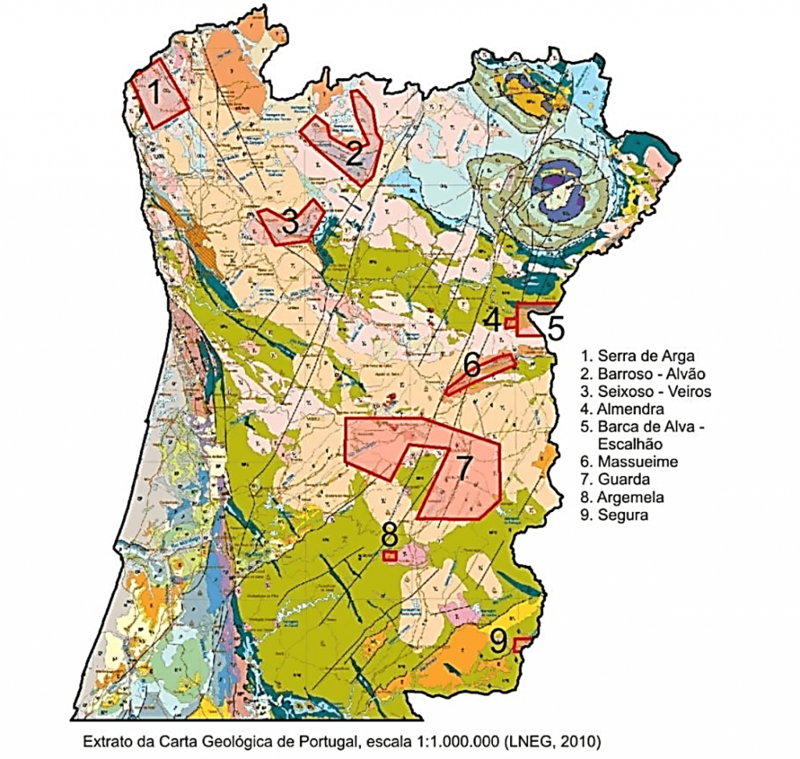 This group produced a final report in March 2017 (Report, 2017), which identified nine geological zones with lithiniferous potential in Portugal (Figure 2). 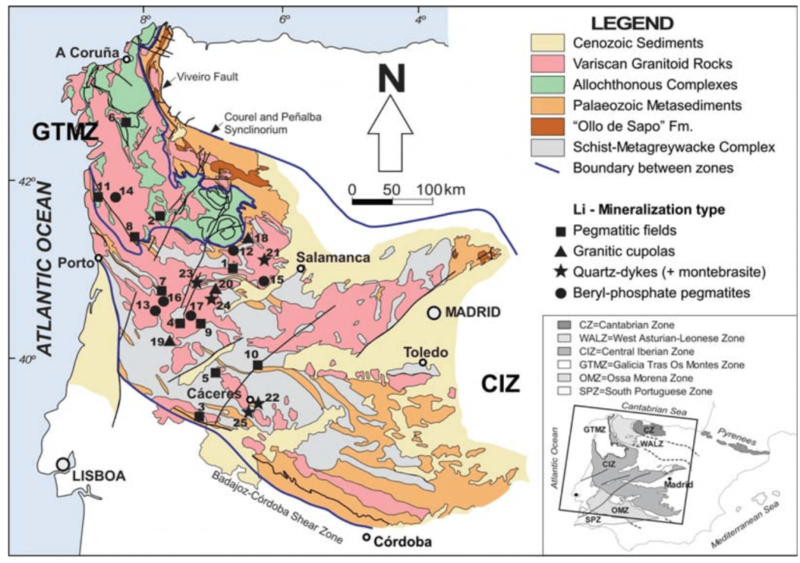 Figure 1: Schematic geological map of the Central Iberian Zone (CIZ) and the Galicia-Trás-os-Montes Zone (GTMZ), with the location of the different Li mineralisation areas of Iberia (4- C57 Mine Concession). (from Roda-Robles et al. 2016, p. 105). 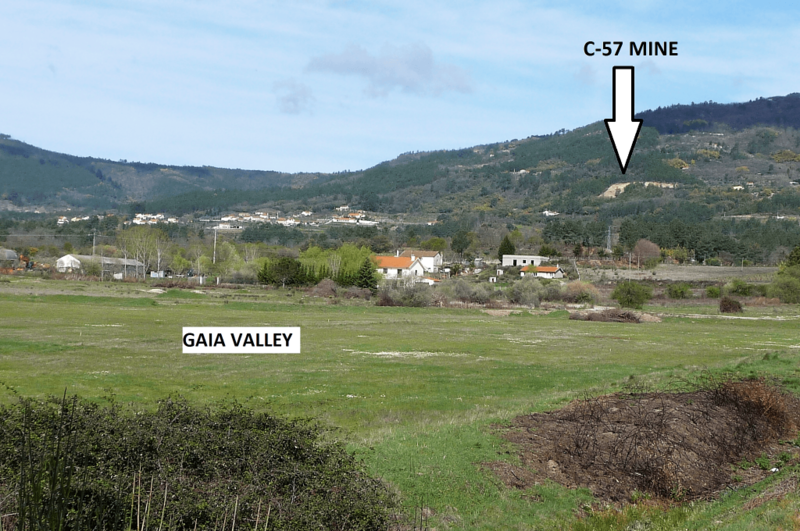 The C-57 mine is located within a rare aplite pegmatite field that outcrops in the Central Eastern region of Portugal. Lithiniferous veins are embedded in the facies of the Guarda porphyroid granite (Antão, 2004), as well as in the surrounding metasedimentary rocks (Roda-Robles et al., 2016; Freitas et al., 2015). The veins exhibit an aplite pegmatite structure consistent with the other sills in the Gonçalo mining field (location 4 in Figure 1), with a main composition of quartz, feldspars and muscovite ± Li, Be, Nb, Ta and Sn minerals (Farinha Ramos et al., 2006). The veins are usually sub-horizontal or with slight inclination of less than 15° and thicknesses about 3.5 m, which permits the open pit exploration of the mine. The mining field is crossed-cut by several late-hercynian faults that structurally control the pegmatitic field. The C-57 mine has been in operation for several decades, mainly in the traditional supply of Li feldspar used by the ceramic companies in the central Portugal region. This product (Li feldspar) allows a significant reduction in the energy consumption during the fabric process of the ceramic industry. As a small mine company, C-57 mine works most of the time with outsourcing services for its mining processes. The Gaia valley, where the Gonçalo mining area is located, has been an extensive mining field of tin, gold and now Li feldspar since Roman times and mainly from the beginning of the 20th century, and its exploitation caused serious environmental impacts with very aggressive repercussions in the local communities (Silva, 2015). One of the objectives of this project is to strengthen the appeal of this area for tourism and leisure activities, thus enhancing the mining heritage of this region. For this, the support of the local population is essential. The concerns of local communities with respect to environmental issues and sustainability are priority issues affecting the exploitation of raw materials (in this case lithium), unless it can be proven that it can be carried out without significant environmental impacts. Each region must take advantage of its natural resources, and in particular its geological endogenous resources, especially when they are specific to those localities. Many of the Portuguese geological resources are in less-favoured areas of the territory, most of them away from the great urban centres. The recently approved IC&DT Project 023720 (LÍTIO Project), submitted through AAC/02/SAICT/2016, will allow the realisation of a set of activities for the enhancement of natural endogenous resources and territorial innovation in Gonçalo (Guarda County, Portugal). The LÍTIO Project has received a grant from the Portuguese government for a period of 18 months, which is the Portuguese state contribution in the co-financed H2020 EU project. It is a joint project among the C-57 mining company (Pegmatítica -Soc. Mineira de Pegmatites, Lda. ), the three polytechnical higher education institutions of the region (Instituto Politécnico da Guarda, Instituto Politécnico de Castelo Branco and Instituto Politécnico de Tomar) and the national professional association (Associação Portuguesa de Geólogos). Figure 3: The Gaia valley and the C-57 mine outcrops. In recent years, tourism is one of the most important sectors of the national and international economy, and the reasons for this success vary. The World Tourism Organisation (UNWTO, 2017) predicts that global revenues from international tourism can achieve the value of 2 billion USD in 2020, which will require an average annual growth of 6 to 7% for the period 1995–2020, much higher than that estimated for the rest of the economy (3.3%), thus providing a prominent place. However, this growth is closely linked to increasing diversification and competition among tourist destinations. The contribution of tourism to the economic development of countries depends on the quality of the revenue that tourism offers. As tourism is a social and economic phenomenon, characterised by various segments of demand, it can be an element of development of the municipalities and regions that require other sources of revenue or even revitalise the local economy. Thus, we must know how to position tourist destinations in a sustainable way in the national and international markets, which are increasingly demanding and complex. Because one of the few operating lithium feldspar mines in Portugal is located here, acting as an important source of income for the region, we can consider this zone a kind of “gathering place” for those who are passionate about the study of lithium. For this, it is necessary to integrate a considerable number of sites of geological interest which, by their peculiarities or rarity, present value or relevance in scientific, educational, cultural, economic and aesthetic endeavours, and may be considered as places to visit. These sites must have other reasons of interest and value, such as ecological, cultural, and historical theme parks or other infrastructures, which should be linked in a network, for tracks, thematic scripts and routes. Thus, it is essential that the structures associated with the mines of the region share knowledge, cultures and experiences, so that all together can position themselves successfully as a destination. As a former mining area with visible deep scars on the territory and in the local community, the involvement of the population through knowledge of the advantages of their natural heritage of geological origin is very important. The elaboration of thematic pathways relating to mining heritages, delimitation of an “open-air museum”, as well as the implementation of visits of schools on all education levels (Moreira et al., 2014) and other institutions, aims at the promotion of this resource in the structuring of differentiated tourism products, such as geotourism and the tourism of experiences. Therefore, the aim is to disclose their own territory to the local community, maximising it as a specific product in the region, which has so far been somewhat ignored on a national scale and in the tourist industry. To pursue these objectives, the proposed activities are developed in the following areas: Topography and Land Survey, Geology and Geotechnics, Environmental impact studies and Geotourism. It is the intention also of the mining partner of this project to complement its activities with the promotion of a cultural/scientific and touristic product. The tasks provided for the Topography and Land Survey group will be in operation until nearly the end of the project to allow for a more accurate mapping of the landscape, through periodic recording of the morphological changes caused by the extractive activity. Further, the land survey in the area near and adjacent to the exploitation will record the geometric and geographic identification of buildings and develop an inventory of property information, which will be created within a GIS (Geographic Information Systems) database, constituting a cadastral information system. This work will be carried out using the reference system ETRS89 TM06 of PT Portugal Continental. The use of a national reference system will make it possible to integrate the resulting topographic plants into a broader territorial context, and so make it possible to expand the level of analysis to other projects in the medium or long term. The representation and three-dimensional modelling of the mining area will make it possible to achieve a better view of the evolution of extraction of material from the vein, and to better plan and manage continuous extraction. The tasks proposed for the geological and geotechnical activities are a surface geological survey and a geophysical prospection to identity the buried mineralised structures. The proposed environmental impact studies are intended to clarify how extractive activity interferes with the quality/quantity of water and air resources in the region. The determination of water quality upstream and downstream of the zone influenced by mining aims to evaluate potential impacts on water bodies through the analysis of physical and chemical parameters such as alkali, alkaline earth, transition and post-transition metals by atomic absorption spectroscopy with atomisation by flame and a graphite furnace. Some anions like chlorides, nitrates, sulphates and phosphates will be determined by ion chromatography techniques. Suspended solids will also be evaluated as well as the electrical conductivity and pH. For the assessment of soil quality and the environmental impact that mining can cause in the surrounding area, determination of alkali, alkali earth, transition and post-transition metals (Al, Au, Ca, Cd, Cr, Cu, Fe, K, Li, Mg, Mn, Na, Ni, Pb, Sn and Zn) will be carried out on representative soil samples. The assessment of air quality will be carried out with a mobile laboratory, which will perform monitoring at different points of the surrounding mining area. The main equipment and accessories installed in the mobile lab are for the determination of PM10 particles, nitrogen oxides, ozone, carbon monoxide, sulphur dioxide, a VOC-BTX analyser for the determination of benzene, toluene, ethylbenzene, m+p-xylene, o-xylene, and a hydrocarbon analyser. As a result of the monitoring activities, reports will be prepared of the impacts of this activity on the quality of water, air and soil. The intention of this study is to inform local inhabitants about these resources to counteract the absence of data that often translates into an ignorance that can be very harmful in terms of public health. These activities will be carried out by teachers and students of Topographic and Environment courses. In this way student learning can be enhanced through the Problem Based Learning approach, enriching the academic experience and enabling students to develop skills in a real environmental context. The Geotourism group will prepare routes/thematic itineraries and design an open-air museum. The image of the touristic destinations depends on what they offer. It is essential that there is an innovative offer which responds to the motivations and expectations of visitors and tourists. In this way, the thematic routes emerge as one of the possible answers, to the extent that they demonstrate their ability to attract visitors/tourists, contributing to the increased visibility of the local tangible and intangible heritage and to the improvement of the image of the destination. The development of products, processes and services with a view to boosting value chains associated with natural geological resources and with the local traditions and customs will be one of the aspects to be explored in this activity. The development of innovative proposals for tourism in the region needs the cooperation of the local population, who will see in this activity a way to highlight the geological singularity of the region associated with a tertiary sector activity that will undoubtedly bring a projection of the region into the panorama of national sustainable tourism. The routes will be geo-referenced and will be expressed in a digital platform (web page) of the project. This digital platform will be also transformed into a mobile application, allowing visitors access to multiple types of information associated to the geomining routes to be established. The following thematic routes are proposed: Route 1 – linked to previous mining activity of the Vale da Gaia. The geological and mining pathways should be implemented in logic of understanding the geological history of the place, as well as their contextualisation in the evolution of the Earth, adding cultural value and scientific, socio-economic and educational importance to the region; Route 2 – a religious path connected with Saint Barbara, patron of miners; Route 3- a cultural route connected to the basketry typical of Gonçalo village. The Open-Air Museum would be located on the former C-57 mine installations, which would allow an open window to the knowledge of the origin of the pegmatites on Earth and a historical stone witness and unique assets in the country related to the ancient mining of lithium. The thematic routes should be designed to converge in the museum space, which would be the centre of all activities to be performed. The entire museum and the thematic routes will be a socio-economic added value for the region, acting as a possible structure of innovative tourism products. This action in cooperation with the owner of the C-57 mine, aims to contribute to the cultural enrichment and tourism promotion of the locality of Gonçalo and to raise awareness of young students to the natural sciences and to the exploitation of natural resources. These objectives will be maximised by the local population’s involvement in the preparation of the activities, through the collection of their experience and diverse materials that reflect the mining activities of the past. The development of the Open-Air Museum, complemented by the proposal for the elaboration of thematic pathways in the aforementioned network, will reduce problems of seasonality, encourage job creation and promote public awareness for the preservation of the cultural and environmental heritage, bringing in general an undeniable asset and promoting the sustainability of this region. It is hoped in the future to create a joint venture between mining companies and cultural tourism through the development of thematic routes promoting the beauty of natural resources, especially those of geological type, which could be attractive not only to the local inhabitants but to a much wider population. The recent approval by the Portuguese government of a National Strategy for Nature Conservation and Biodiversity for 2030 (Resolution of the Council of Ministers No. 55/2018, 7 May 2018) undoubtedly points to the path of conservation of the values of the natural heritage and its geodiversity with the safeguard of the cultural identity. The LITIO project has received funding from the European Union’s Horizon 2020 research and innovation programme contract FCT, COMPETE SAICT/16 under Grant Agreement No. 023720. The authors wish to thank the reviewers of this article for their work. Antão, A. M. 2004. Comportamento geotécnico do granito da Guarda relacionado com a sua alteração alteração (Geotechnical behavior of Guarda granite related to its alteration). Ph.D. Thesis, Coimbra University, Portugal. Farinha Ramos, J. 2007. Locality N°5, Seixo-Amarelo – Gonçalo rare element aplite-pegmatite field. In: A. Lima & E. Roda-Robles (eds). Granitic Pegmatites: the State of the Art, Field Trip Guidebook, Dep. Geologia da FCUP, Porto, Portugal, Memórias no. 9, pp. 73-87. Farinha Ramos, J., Bravo Silva, P., Neiva, A.M.R., Gomes, E.P. 2006. Evolução geoquímica de pegmatitos LCT da região Centro de Portugal no sentido do enriquecimento em lepidolite (Geochemical evolution of LCT pegmatites from the central region of Portugal in the sense of lepidolite enrichment). Proc.VII Cong. Nac. Geologia, pp.1193-1198. Freitas, M. C., A. Guedes, A., Noronha, F. 2015. P-T Conditions of Subsolidus Modifications on Rare Metal Enriched Pegmatites. An Example from Central Portugal. Proc. SGA, Mineral resources in a sustainable world. Vol. 2, pp. 457-460. Report, 2017. Relatório do grupo de trabalho “Lítio“ (Report of the working group “Lithium”). Available online at http://www.lneg.pt/divulgacao/noticias-institucionais/535. Resolution of the Council of Ministers No. 55/2018, 2018. Estratégica Nacional de Conservação da Natureza e Biodiversidade para 2030 (ENCNB2030), ((National Strategy for Conservation of Nature and Biodiversity for 2030), Portugal. (https://www.confagri.pt/documentos/resolucao-do-conselho-ministros-no-552018-aprova-estrategia-nacional-conservacao-da-natureza-biodiversidade-2030/Acessed on 14 May 2018). Roda-Robles, E., Pesquera, A., Gil-Crespo, P., Vieira, R., Lima, A., Garate-Olave, I., Martins, T. & Torres-Ruiz, J. 2016. Geology and mineralogy of the Li mineralization in the Central Iberian Zone (Spain and Portugal), Mineralogical Magazine, 80/1, 103-126. Roda-Robles, E., Villaseca, C., Pesquera, A., Gil-Crespo, P.P., Vieira, R., Lima, A., Garate-Olave, I. 2018. Petrogenetic relationships between Variscan granitoids and li-(F-P)-rich aplite-pegmatites in the Central Iberian Zone: Geological and geochemical constraints and implications for the other regions from the European Variscides. Ore Geology Reviews, (95) 408-430. DOI.org/10.1016/j.oregeorev.2018.02.027. Silva, P.G. 2105. Mobilização e narrativas populares contra a mineração em Portugal: o caso da dragagem de estanho. In: Conflitos ambientais na Indústria Mineira e Metalúrgica: o passado e o presente (Mobilization and popular narratives against mining in Portugal: the case of tin dredging. In: Environmental conflicts in the Mining and Metallurgical Industry: the past and the present). (Guimarães & Cebada) Eds. Centro de Investigação em Ciência Política, Universidade de Évora (Portugal) e CETEM/MCTI Rio de Janeiro (Brasil). USGS, 2018. U.S. Geological Survey, Mineral Commodity Summaries.